Does mowing, burning, or spraying sagebrush actually help? Kurt Smith plucks the fifth secondary feather from the five-week-old sage grouse’s wing, then loosens his gentle hold on the bird, releasing it to return to its mother and brood mates in the darkness. 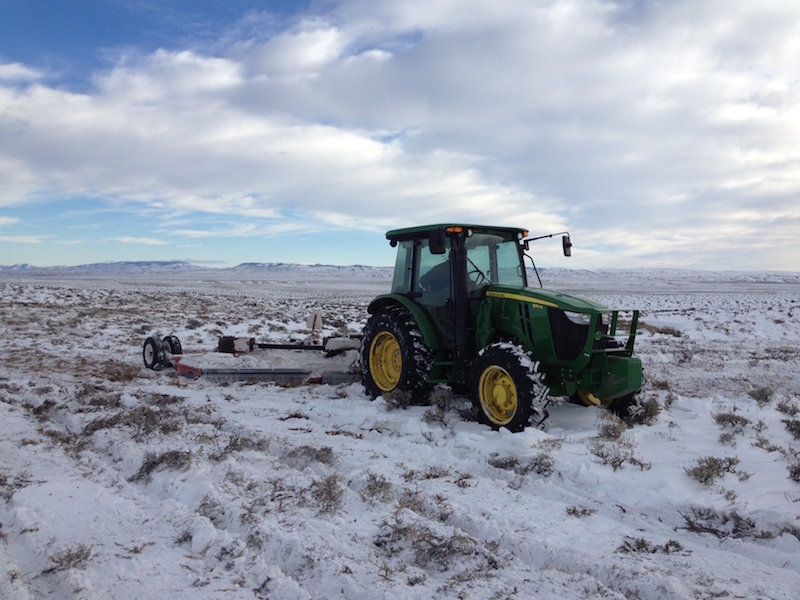 A tractor mows sagebrush as part of a long-term habitat study near Jeffrey City, Wyoming. Photo courtesy Jason Carlisle. This bird’s part in an important research project is now complete. Smith will later analyze the feather to study the chick’s diet composition as part of his PhD work. Findings from this research will clarify how best to improve sage grouse habitat. In the high sagebrush country outside central Wyoming’s Jeffrey City, researchers led by Dr. Jeff Beck, an associate professor in the University of Wyoming Ecosystem Science and Management Department, are launching a multi-year study to better understand the best way to manage land to meet sage grouse habitat needs. The 736,000-acre study area is mostly federal land used for cattle grazing and big game hunting. Now it’s also an important field laboratory for a cooperative study between the University of Wyoming, Wyoming Game and Fish Department, Bureau of Land Management, Wyoming Cooperative Fish and Wildlife Research Unit, Boise State University, and other partners. The research team will analyze sage grouse responses to vegetation treatments in sagebrush habitat. Throughout their life cycle, sage grouse rely on sagebrush for food and shelter. They nest under the sagebrush canopy to hide from predators. Through the summer they eat forbs (wildflowers and other leafy plants) that grow between the sagebrush plants. The chicks rely on the ants, beetles, grasshoppers, and other insects that live in the sagebrush ecosystem. In the fall and winter, sage grouse eat sagebrush leaves. “The way sagebrush communities change is through disturbance events such as fire or drought,” Beck said. “[Disturbance] reduces the overstory cover of sagebrush, effectively releasing the understory from overstory competition, thus promoting growth of forbs and grasses, then new sagebrush.” Managers often burn or mow Wyoming big sagebrush or apply herbicides on it to mimic natural disturbances and jump-start new plant growth, but it’s up for debate exactly how much such treatments actually help grouse. Beck hopes the new project near Jeffrey City will further our limited understanding of what these treatments mean for grouse. Beck and his colleagues are putting the effects of the herbicide Spike 20P—which at low application rates kills shrubs but not grass or forbs—and mowing treatments under the lens in the Jeffrey City study. They will also analyze grazing exclosures to see how vegetation responds when cattle and wild horses are kept out of an area. Though Beck has long studied how sage grouse habitat responds to treatments, this will be the first time he and his colleagues also monitor the grouse response to treatments. The researchers conducted the pre-treatment phase of the study in 2011 through 2013. They implemented treatments in winter and spring of 2014, mowing some areas and aerially applying Spike20P on different sections of the study area. Now, post-treatment monitoring is planned to continue through 2023, with the research team monitoring treated and untreated areas over the next eight years. They will compare grass, forb, insect, and sagebrush recovery, as well as grouse populations, among mowed, herbicide-treated, and non-treated areas. 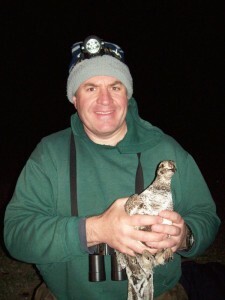 Scientist Jeff Beck with a sage grouse captured as part of a habitat study. Photo courtesy Jeff Beck. Treatment and control sites span areas where resource selection modeling suggests female sage grouse will likely rear their broods. To measure adult female sage grouse survival, nest success, and brood survival, researchers capture grouse and record their age, wing length, and weight. They collect blood and affix radio or GPS transmitters to the grouse. They also record numbers of nests that hatch, count chicks, and sample feathers from two chicks in each brood. They hope this data will help them evaluate how sage grouse fare following the habitat modifications. Sage grouse numbers have nosedived throughout the West over the past century, and scientists are urgently looking for ways to reverse these declines. “If managers can increase nest survival, chick survival, or adult female survival, then they will have the ability to increase populations, so it does become a really important practice if the connection between treatments and population response can be made,” Beck said. With nearly 40 percent of remaining sage grouse located in Wyoming, it’s especially important to focus on habitat conservation efforts within the state. The Jeffrey City study will build on Beck’s previous studies that evaluated effects of mechanical and chemical treatments and prescribed fire on grouse habitat. Starting in the late 1980s, Beck and co-researchers evaluated sites in the Big Desert of southeastern Idaho. They gathered baseline data for one year before a prescribed burn in 1989, and then continued the study for ten out of the fourteen years from 1990 to 2003. They focused on the habitat features that sage grouse rely on for nesting, rearing their young, and wintering. While they found that grass and litter recovered fairly quickly following treatments, prescribed fire caused measurable changes in habitat features, including reduced forb cover and richness, even fourteen years later. The researchers recommended against burning Wyoming big sagebrush for sage grouse habitat enhancement. More recently, Beck and graduate student Jennifer Hess measured vegetation structure on previously prescribed burned and mowed sites along with untreated reference sites in Wyoming’s Bighorn Basin to see if burning or mowing Wyoming big sagebrush increased grass height and cover. “We wanted to compare mowing to burning in particular because mowing has been known to leave residual sagebrush on site with so many advantages for sage grouse,” Beck said. There, they found that while burning did increase grass cover, in some cases treated sites did not meet the minimum sagebrush guidelines for sage grouse breeding habitat. It took mowed sites at least a decade to provide enough sagebrush cover and height to protect the birds from harsh weather and predators. Even 19 years post-treatment, burned sites still did not meet the guidelines for sagebrush in breeding habitat. Beck and Hess recommended managers not burn or mow sagebrush to improve grass production because any benefits to grouse were outweighed by the lost sagebrush structure. 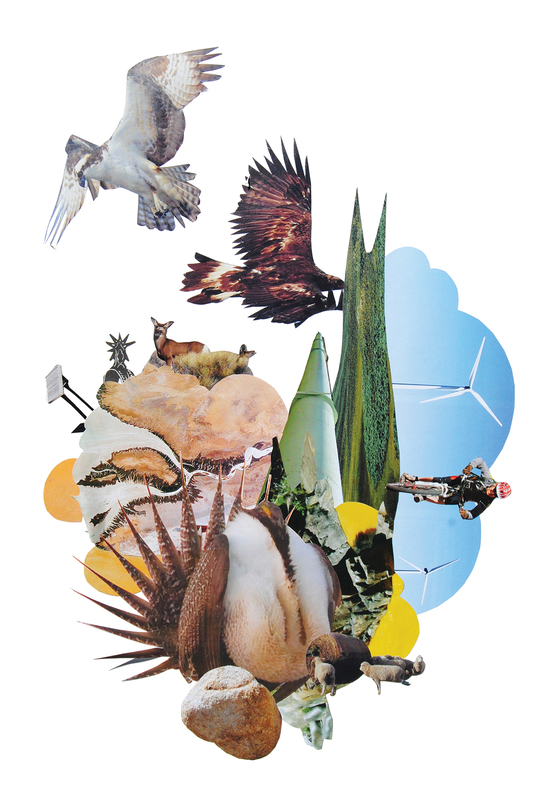 See illustrations of different techniques for managing habitat in Sagebrush Treatments. Jeffrey L. Beck, John W. Connelly, and Kerry P. Reese, “Recovery of Greater Sage-Grouse Habitat Features in Wyoming Big Sagebrush following Prescribed Fire,” Restoration Ecology 17 (2009) 393-403, doi: 10.1111/j.1526-100X.2008.00380.x. Kirk Davies, Chad Boyd, Jeffrey Beck, Jon Bates, Tony Svejcar, Michael Gregg, “Saving the sagebrush sea: an ecosystem conservation plan for big sagebrush plant communities,” Biological Conservation 144 (2011) 2573–2584, doi:10.1016/j.biocon.2011.07.016. Jennifer Hess and Jeffrey Beck, “Burning and Mowing Wyoming Big Sagebrush: Do Treated Sites Meet Minimum Guidelines for Greater Sage-Grouse Breeding Habitats?” Wildlife Society Bulletin 36 (2012) 85-93, doi: 10.1002/wsb.92. 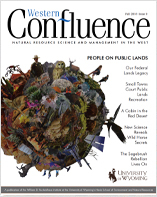 Jeffrey Beck, John Connelly, and Carl Wambolt, “Consequences of treating Wyoming big sagebrush to enhance wildlife habitats,” Rangeland Ecology and Management 65 (2012) 444–455, doi: 10.2111/REM-D-10-00123.1. Jennifer E. Hess and Jeffrey L. Beck, “Forb, Insect, and Soil Response to Burning and Mowing Wyoming Big Sagebrush in Greater Sage-Grouse Breeding Habitat,” Environmental Management 53 (2014) 813-822, doi: 10.1007/s00267-014-0246-6. So much of the response depends upon the condition of the site prior to any treatments; but we already know this. If one considers Ecological Site Descriptions as a part of the equation, responses are pretty well spelled out – we just need to be implementing things on a larger scale. In many cases, we are lacking adequate ground cover and understory diversity which can only be obtained by some kind of seeding strategy with some overstory sagebrush removal. Sometimes I don’t really think we are implementing the right types of treatments if we are looking at adding vegetative diversity back into the equation.